Is there anything such as Auspicious Time? The art and science of selecting an auspicious time is called Muhrata in Vedic astrology. You may argue that every moment belongs to God (or Universe or Kala Purusha i.e. eternal cosmic being), then how can one instance of time be better or worse than the other? Pure Science: If you ever rode a bicycle, you will know that riding against the wind takes much more effort than riding with the wind. Similarly, sailing against the wind is not as easy as sailing with the wind. And sowing a seed during peak winter most probably will not yield a good crop versus sowing during the spring or appropriate season. Similarly, tasks, projects or journeys initiated at the “auspicious times” have more chances of yielding better results. Does that mean guaranteed success? Of course not. There is no guarantee that selecting an auspicious time will remove all obstacles. Our past karma governs the overall results we will experience. Even riding with the wind, you may have a flat tire. Even while sailing with the wind, a shark may jump out of the water and land on your boat. Even if you sow seeds in the best possible season, you may lose the crop to insects or drought etc. So how does it work? What we are doing by selecting an auspicious time is aligning our actions with the energies of the Universe. That choice is ours. It is our Free Will. Specific planetary alignments indicate “good” or “bad” conditions for doing specific things. Some alignments are good for spiritual work and others are more conducive for material pursuits, undertaking journeys etc. Now how do we select the auspicious time? Some people rely on their intuition, some get guidance from a Guru and some go to an astrologer. Others just ride the tide. This entry was posted in Uncategorized on July 30, 2014 by illuminatelifetoday. 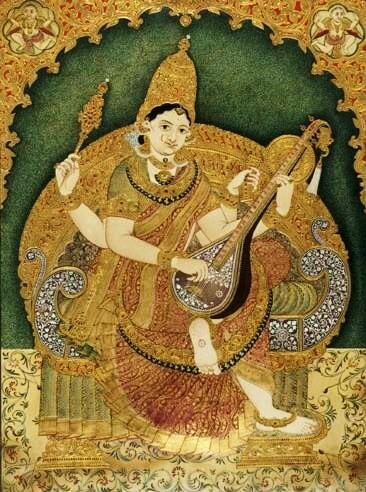 Saraswati is the Goddess of learning, arts, music and wisdom. She is the consort of Lord Brahma. There is a yoga (combination) in astrology called Saraswati Yoga. Roughly speaking, this combination takes place when Jupiter, Mercury and Venus are (together or separately) in angles, trines or second house and are strong. Jupiter is exalted in the skies right now. Mercury is in its own sign Gemini and will join Jupiter later today. Venus will join them both on August 7. We will see this yoga for at least a few hours everyday (depending on which sign is rising) until the end of August. Go ahead and take advantage of these planetary combinations by immersing yourself in the divine knowledge, learning, arts, music and writing. Here is a beautiful prayer to Saraswati. O Mother Goddess, may you remove my ignorance! This entry was posted in Uncategorized on July 28, 2014 by illuminatelifetoday. MEDITATION becomes very very powerful and beneficial on this special day. Every 27 days, on the day of New Moon, Sun and Moon mate and give birth to a new cycle. This month’s new Moon cycle will begin in Cancer in Pushya nakshatra. Moon rules Cancer and Jupiter is exalted in Cancer. Cancer is the fourth sign in natural zodiac. Fourth sign represents our Heart, our innermost emotions, our happiness and joy. Exact birth of this new cycle takes place around 15:40 pm pacific time today. Sun, Moon and Jupiter all 3 are in Pushya Nakshatra today – a very rare and extremely auspicious placement. Pushya symbolizes knowledge. The deity of Pushya is Brihaspati, the guru of the Gods. These 3 planets are “friends” in Vedic astrology. All 3 meeting in the nakshatra of Brihaspati on New Moon is like 3 spiritual friends going to the gurukul to gain wisdom. This entry was posted in Uncategorized on July 26, 2014 by illuminatelifetoday. If you are like me, I’m sure you would have felt it hard to make decisions “on your own” at some point or the other in your life. Especially during these current transits where people will find it extremely hard to take even small decisions, let alone long term planning. SWAR YOGA: use the breath as your guide. If you have yes/no question, simply observe which nostril is active at the time question arises in your mind. If your Left nostril is active and the question was asked on Monday/Wednesday/Thursday/Friday, the answer is yes and if the right one is active on these days, answer is no and similarly vice versa. This is because energy of benefic planets is more active on M/W/Th/F and malefics on Tu/Sa/Su. WATCH: Check the time on your watch. Decide beforehand that if it is odd minute, answer will be yes but if it is even minute then the answer is no or vice versa but make sure you decide on which one it will be before looking at the watch. TALISMAN: Have a personal talisman with 2 sides and simply flip it but again decide before flipping which side is yes and which side is no. You can carry this talisman with you all the time in your wallet. RISING SIGN: Sometimes astrologers simply cast the chart at the time question was asked and if an odd sign is rising at that time, the answer is yes and vice versa. Again, the astrologer has to decide beforehand whether odd sign is yes or even sign is yes. No this is not woodoo or superstition. As I said, we are constantly being guided by the Universe and angels and our ancestors. They are nudging us all the time. So when we flip our talisman or look at the watch, it is not a random flip. The angels are giving it an extra nudge to bring about the needed outcome for that particular moment for us. This entry was posted in Uncategorized on July 25, 2014 by illuminatelifetoday.